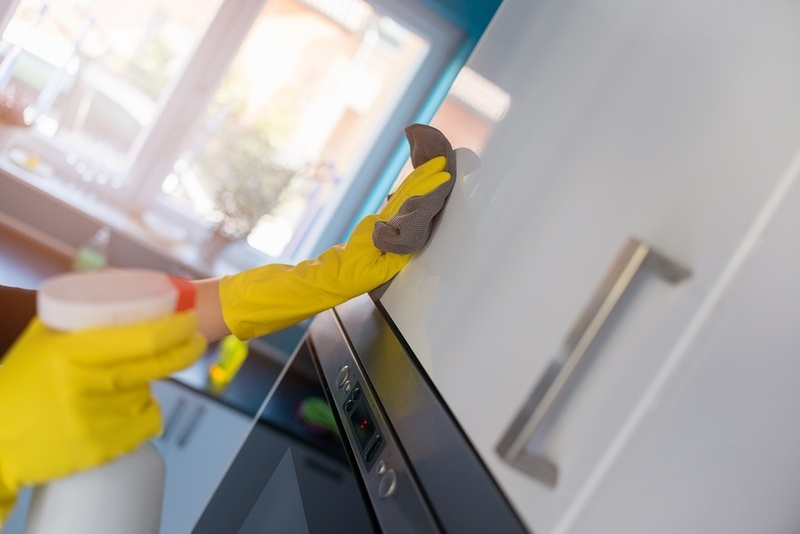 A kitchen is a magnet for grease, bacteria and food particles that go airborne – not to mention all the scuffs and handprints left behind in a whirlwind of activity. Mix 2 cups of water to every 1 cup of mild dish soap or detergent. Clean the cabinets with the solution, wipe them with a damp cloth then dry them with a microfiber cloth (which will not leave dust behind). Remove tough stains by applying a paste made with baking soda and water. Wipe the paste gently over the cabinets, remove the residue with a damp cloth then dry. Use any of the methods above for cabinets covered with oil-based paint. Oil is more durable than latex and should hold up to a good scrubbing if your cabinets need it. Stick with soap and water or vinegar and water on cabinets covered with latex-based paint; baking soda could scratch the surface and even remove the paint. People often think white cabinets are the most difficult to keep clean. It's actually black that is the least forgiving color; you can spot water and grease spots and dust on black cabinets from several paces away. To combat this, wipe black cabinets at least weekly with a damp microfiber cloth to prevent buildups. Restore the luster to white cabinets with a damp cloth, at least weekly. As a safeguard, keep a small jar of matching white paint nearby to cover the chips and scratches that can mar the sleek look of white cabinets. The low-maintenance quality of laminate may be one of the reasons you chose this material (or are glad the previous owner did). Wiping these cabinets weekly with a damp microfiber cloth – assisted by a little soap for pesky stains – is all you need to keep them looking their best. Gentle soap and water or an all-purpose cleaner will restore the luster to metal cabinets. Be sure to keep the moisture to a minimum since it can, over time, cause the metal to rust. Once your cabinets are clean, you'll want to show them off in the best light possible – literally. Enter Polar Shades, America's premier manufacturer of premium interior (and exterior) shades. Call 702-260-6110 to make an appointment for a free in-home consultation. We can show you how the right shade can complement the color and architectural details of your cabinets – and provide the essential crowning touch in this action-packed room.